There are two categories of oaks. 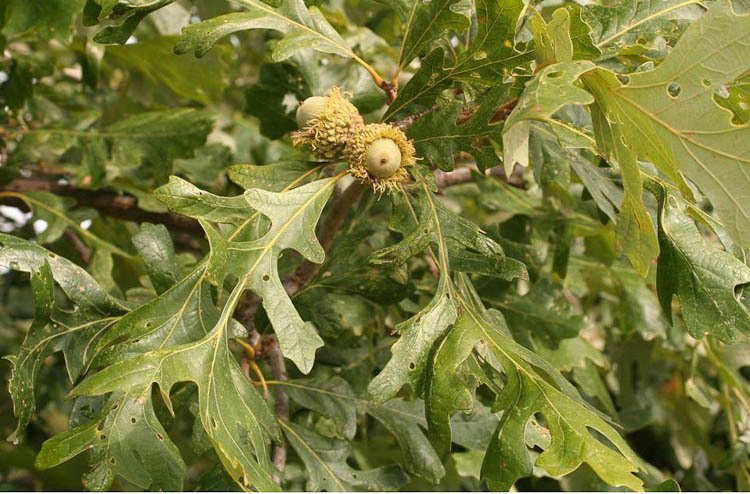 Members of the WHITE OAK GROUP have leaves that are bluntly lobed, have acorns that mature in just one year after flowering, and are generally sweet (or at least not very bitter).The bur oak (Quercus macrocarpa) shown below is in the white oak group. 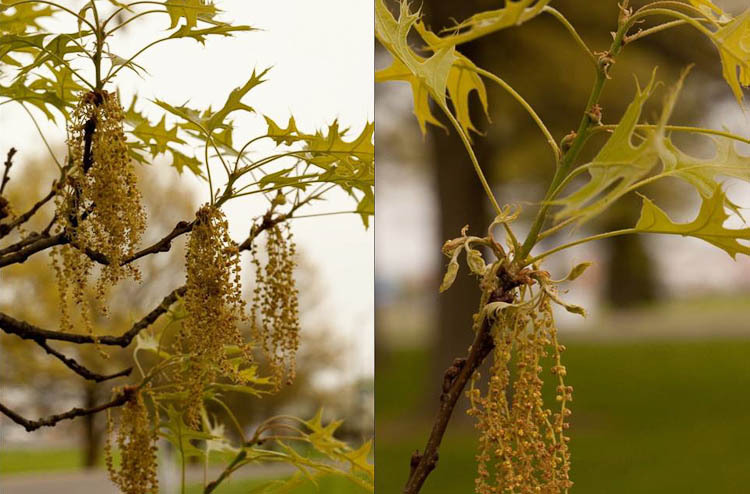 Oaks (Quercus) have alternate, simple, lobed (in most Ohio species) leaves. 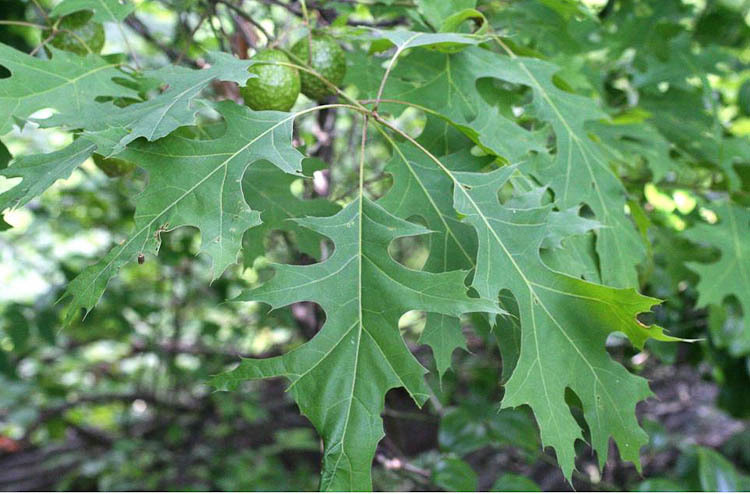 Conversely, members of the RED OAK GROUP have bristle-tipped lobes, and acorns that take two years to mature, and that are quite bitter owing to the presence of tannic acid. Red oaks have bristle-tipped leaves. Oaks have more galls than any other tree. What are galls? I’m glad you asked. Wait, it was ME who asked, wasn’t it? Was it a rhetorical question? No, But that was a rhetorical question. What was? I’m glad you asked. I didn’t. You did. Can we start over? O.K. GALLS are peculiar structures that plants produce in response to attack by particular organisms, usually insects, but also other arthropods or, broadly defined, sometimes fungi as well. The galls are very distinctive, and can usually be used to identify the organism that caused it. A lot of oak galls are caused by tiny wasps, the immature stages of which develop inside them. 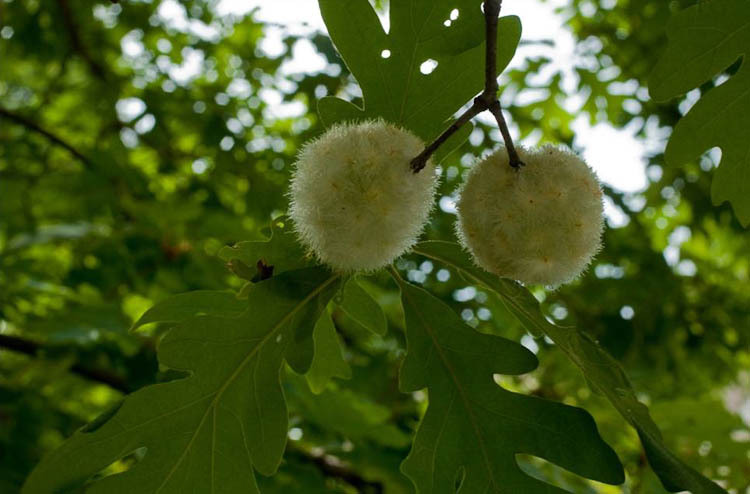 The photo above shows “oak apple” galls, looking like papery ping-pong balls. 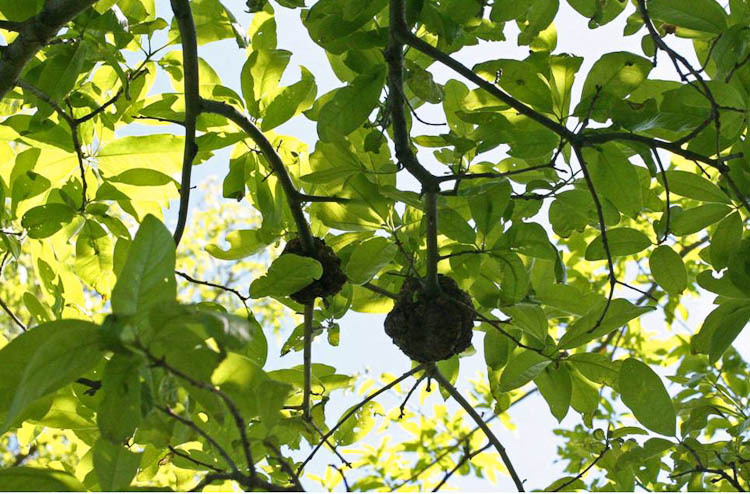 Because of an especially high concentration of tannic acid, this woody oak gall has been used to produce a type of ink. These woody galls are especially common on pin oak. Like many trees, oaks produce separate make and female flowers, but both types are on the same tree (i.,e., they are monoecous). 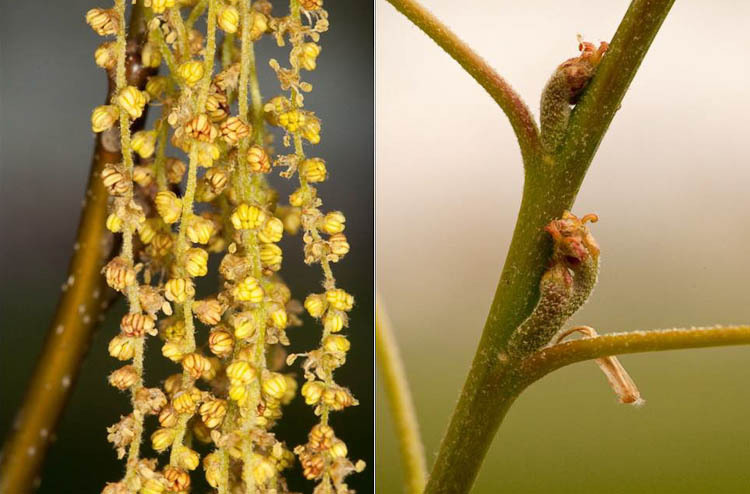 Male oak flowers are tiny, in elongate catkins; the female ones are fewer and larger. Here’s a closer-up view of the male and female flowers. Oak flowers. Left: male. Right: female.